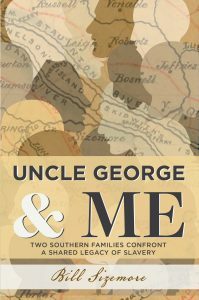 Over the next 10 days I’ve got three library gigs in which I’ll do readings from my new book Uncle George and Me: Two Southern Families Confront a Shared Legacy of Slavery, beginning with one in Richmond. At each location I’ll try to spark a deep conversation about race – a topic that has taken on new urgency as we approach a critical national election at a time when hate speech and hate crimes are raging out of control. I’ll be at the downtown Richmond public library at 101 E. Franklin St. on Thursday, Nov. 1, at 6 p.m.
Then it’s on to the public library at 1294 Jefferson St. in Boydton, Va., on Wednesday, Nov. 7, at 6 p.m. That’s in Mecklenburg County, where the book is set. The next evening, Thursday, Nov. 8, I’ll visit the public library at 509 Broad St. in South Boston, Va., my birthplace, at 5:30 p.m.
Later in November I’ve got two more outings scheduled: a signing at the New Town Barnes & Noble, 5101 Main St., Williamsburg, Sunday, Nov. 11, 1-3 p.m., and a reading at the G.C. Shaw Museum, 202 E. McClanahan St., Oxford, N.C., Sunday, Nov. 18, 3-5 p.m.
At each site I’ll have copies of the book available for sale and signing. I’m looking forward to reconnecting with old friends and making new ones.